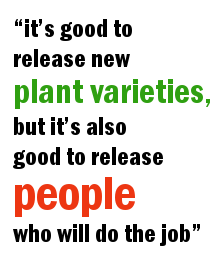 So says Chiedozie Egesi, a plant breeder and geneticist who has been one of the inspirational leaders and Principal Investigators for the CGIAR Generation Challenge Programme’s (GCP) Cassava Research Initiative in Africa. 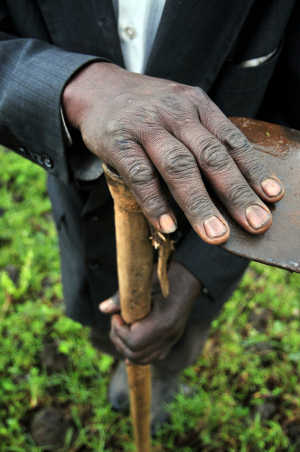 It was his commitment to helping farmers that led Chiedozie to forsake his dream of becoming a surgeon, and instead to train as a plant breeder and help smallholder farmers in Nigeria. 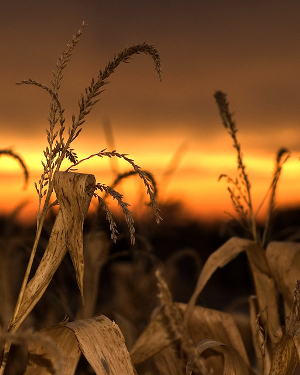 Having grown up in a small town in south-eastern Nigeria where poverty was a daily reality, he was particularly concerned about food security and nutrition for the people. 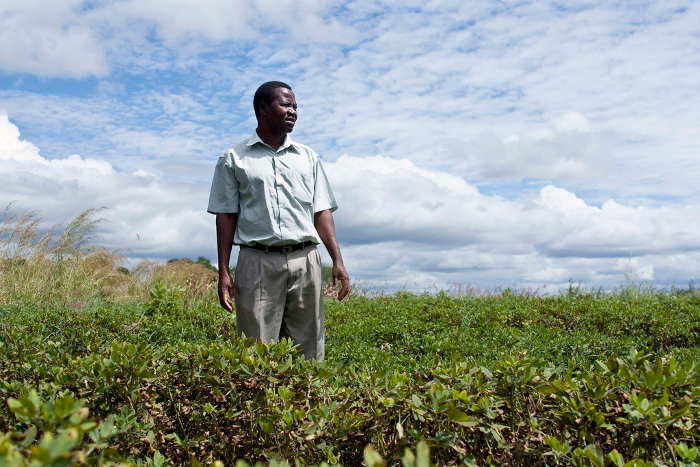 He dreamt of developing cassava varieties that could beat the pests and diseases that often devastate such crops. 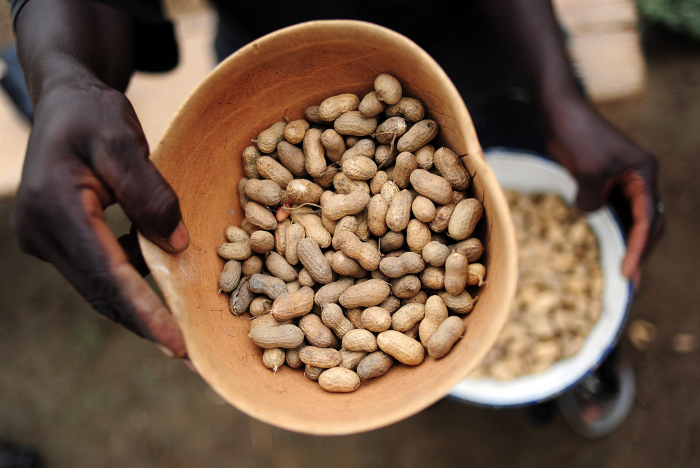 “The food people grow should be nutritious, resistant and high-yielding enough to allow them to sell some of it and make money for other things in life, such as building a house, getting a motorbike or sending their kids to school,” Chiedozie says. 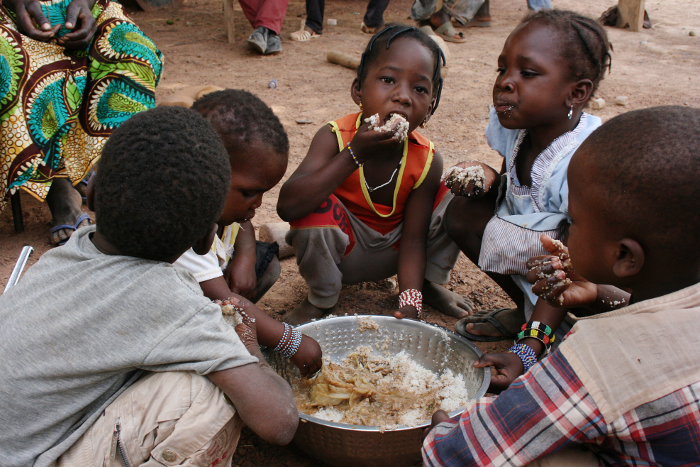 Nigeria is the most populous African country, with a population of more than 174 million. 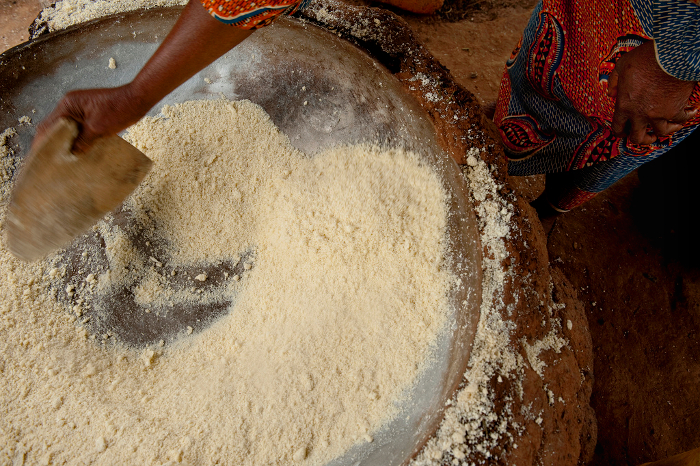 The main staple food is cassava, making Nigeria the world’s largest producer and consumer of the crop. 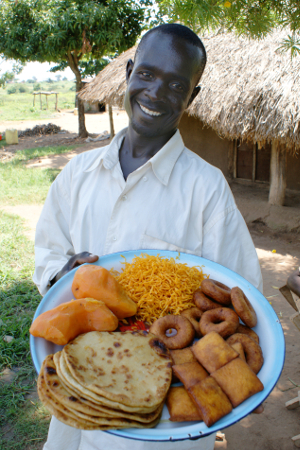 But cassava is also important in other African countries. 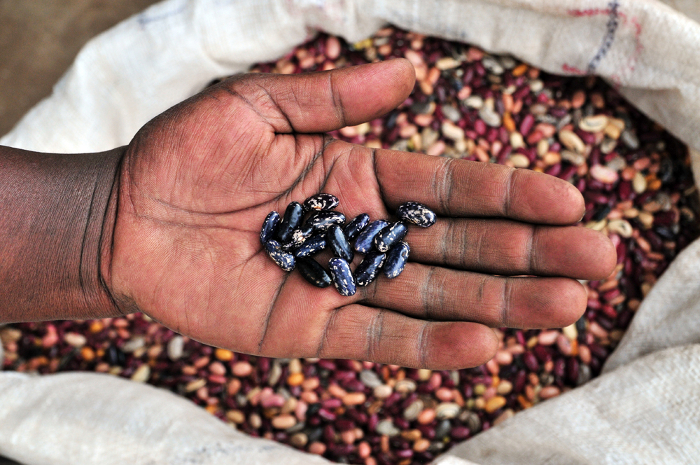 It is grown by nearly every farming family in sub-Saharan Africa. 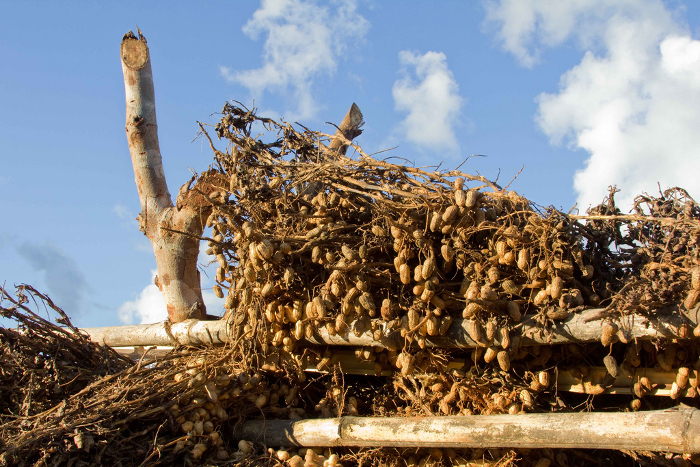 Africa produced nearly 140 million metric tonnes of cassava in 2012 – but most of the production is low-yielding subsistence farming for food by small-scale farmers for food for their own households alone. 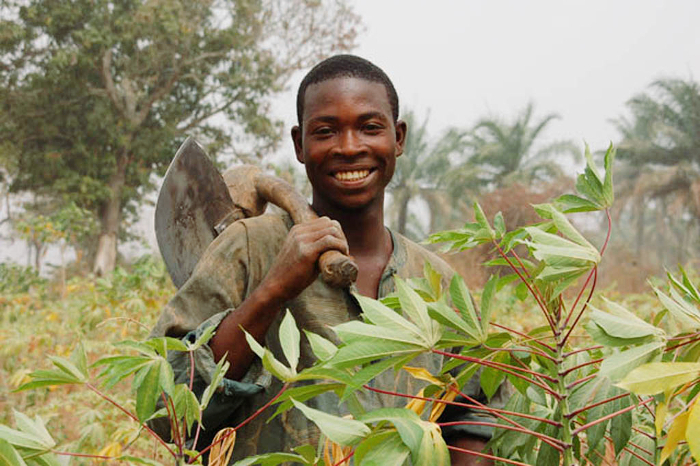 After almost eight years working on GCP-supported cassava projects, Chiedozie is proud of what they have managed to accomplish: “That we’ve been able to give African farmers the varieties that they will love to grow is my biggest achievement”. 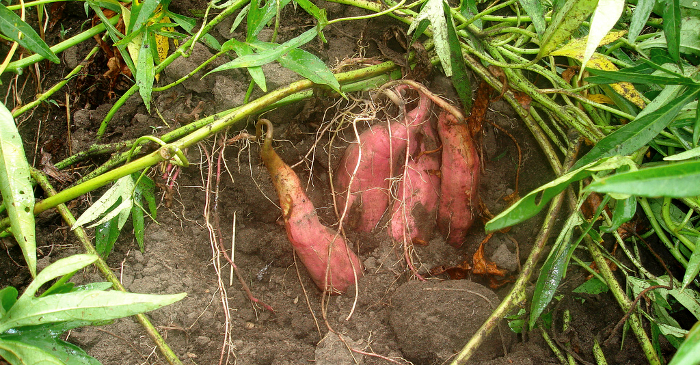 Chiedozie’s journey with GCP began after he had gained his PhD in yam breeding from the University of Ibadan, Nigeria. He undertook further studies and training at Cornell University and the University of Washington, both in the USA. 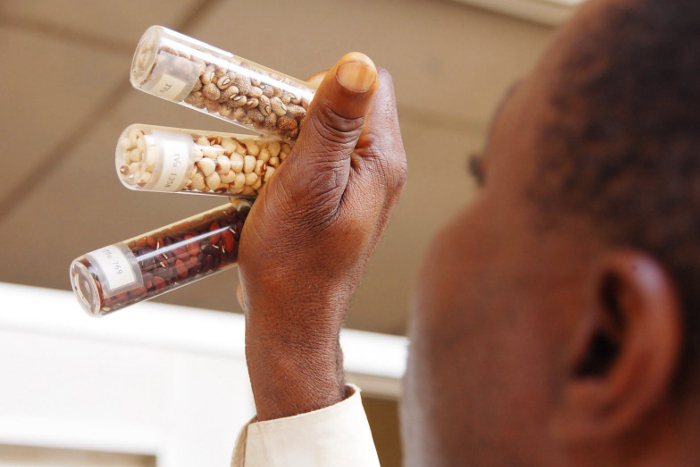 He then returned home to Nigeria to lead the cassava breeding team at the National Root Crops Research Institute (NRCRI) and, following a promotion in 2010, was made Assistant Director of NRCRI’s Biotechnology Department. 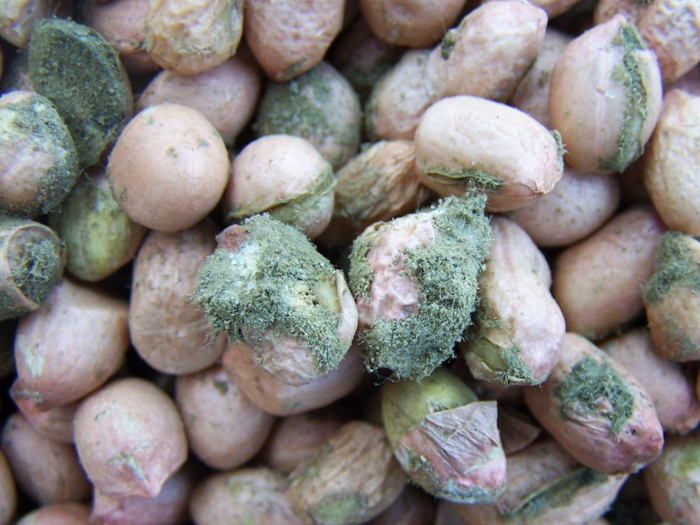 In 2004, a chance find on the Internet of a molecular breeding training programme in South Africa first led to Chiedozie’s involvement in GCP. 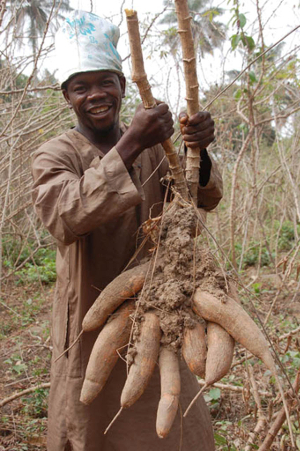 In 2010, work by Chiedozie and the NRCRI team, in collaboration with a transnational network of partners, resulted in the official release to Nigerian farmers of Africa’s first cassava variety developed using molecular-breeding techniques. 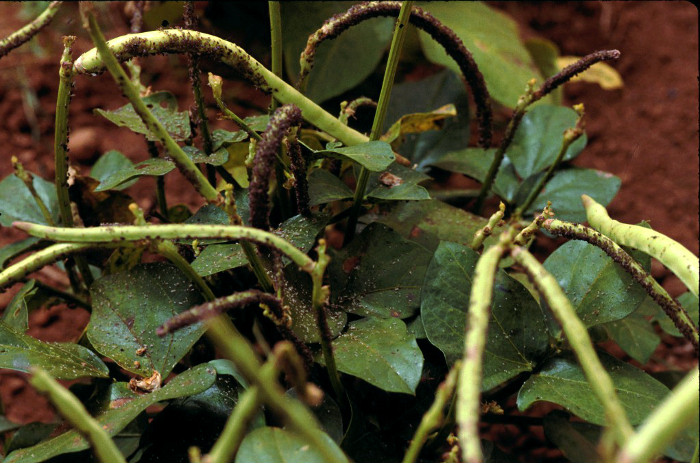 Known as UMUCASS33 (or CR 41-10), it was resistant to cassava mosaic disease (CMD) – a devastating plant disease that can wipe out entire cassava crops – and also highly nutritious. 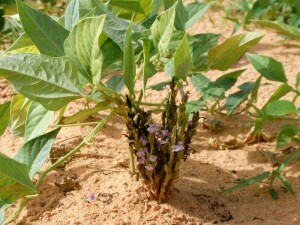 In addition to a stream of further disease-resistant varieties, in 2012 they followed this accomplishment with the release of a high-starch variety bred using molecular techniques. 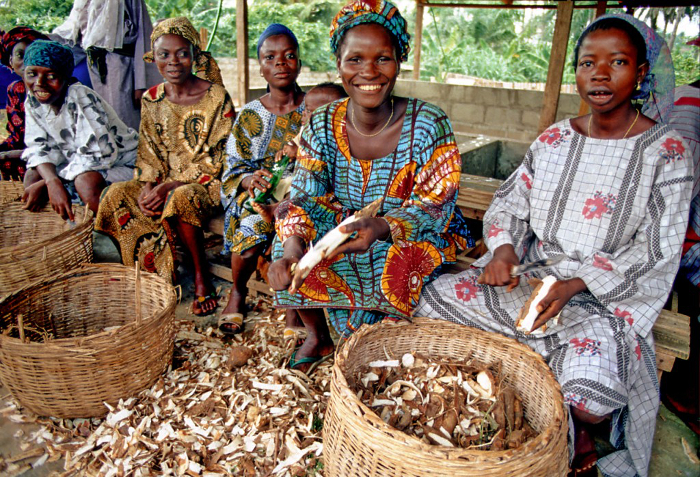 Nigerian women at work processing cassava. 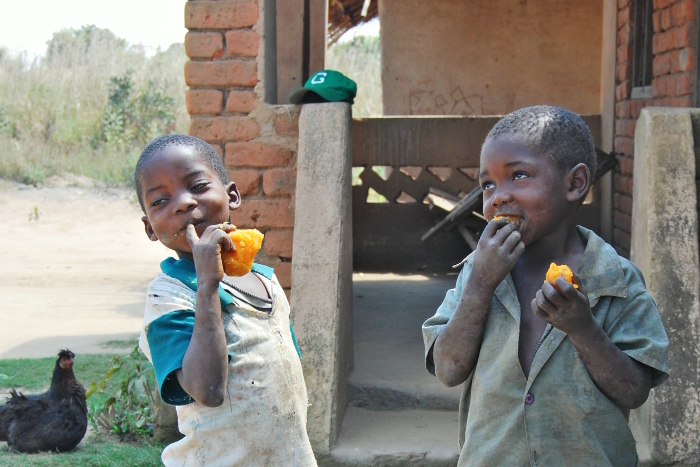 In 2011, the cassava team together with the International Institute of Tropical Agriculture (IITA) and HarvestPlus (another CGIAR Challenge Programme focussed on the nutritional enrichment of crops), released three cassava varieties rich in pro-vitamin A, which hold the potential to provide children under five and women of reproductive age with up to 25 percent of their daily vitamin A requirement – a figure Chiedozie and his team are now ambitiously striving to increase to 50 percent. 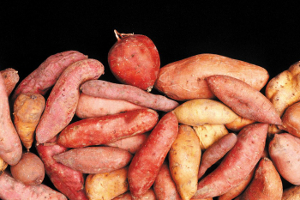 In 2014, they released three more pro-vitamin A varieties with higher concentrations of beta-carotene. 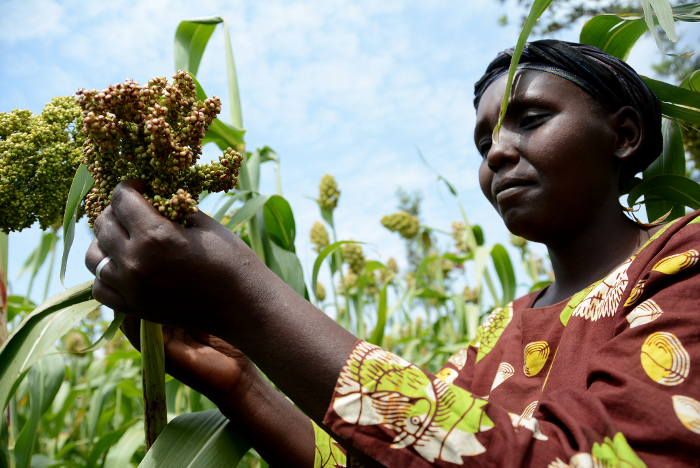 These new and improved varieties – all generated as a direct or indirect result of his engagement in GCP projects – are, Chiedozie says, worth their weight in gold for the people of Africa. 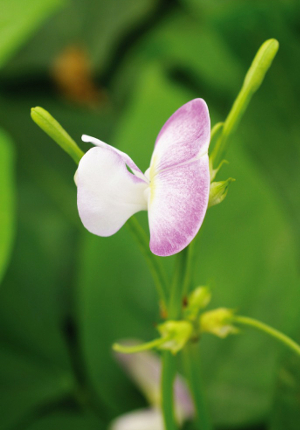 Chiedozie believes a crucial element of GCP’s success in breeding better cassava varieties for smallholder African farmers lies in the capacity building and infrastructure support provided by GCP. 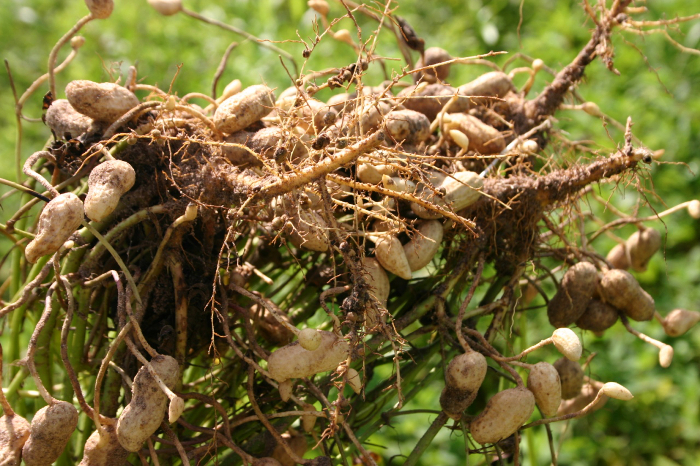 The networking opportunities offered by the Cassava Community of Practice – founded by GCP and now hosted by the Integrated Breeding Platform (IBP) – have meant that Chiedozie and his colleagues could expand their collaboration at the local, national and regional levels: “We now have a network of cassava breeders that you can count on and relate with in different countries. This has really widened our horizons and also made our work more visible,” he says, citing effective links formed with Côte d’Ivoire, Ethiopia, Ghana, Liberia, Malawi, Mozambique, Sierra Leone and South Sudan. 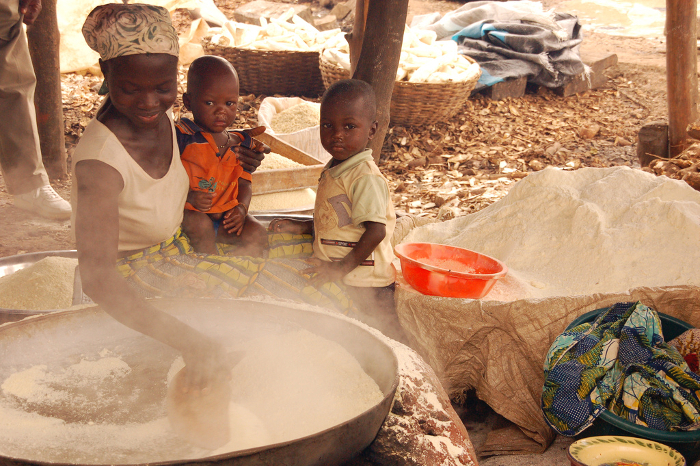 Selling fufu, a staple food made with cassava flour, at a market in Nigeria. These opportunities have led to what Chiedozie calls a ‘paradigm shift’ in how national research agencies are viewed by donors and research investors: “GCP helped us to build an image for ourselves in Nigeria and in Africa, and this created a confidence in other global actors, who, on seeing our ability to deliver results, are choosing to invest in us. 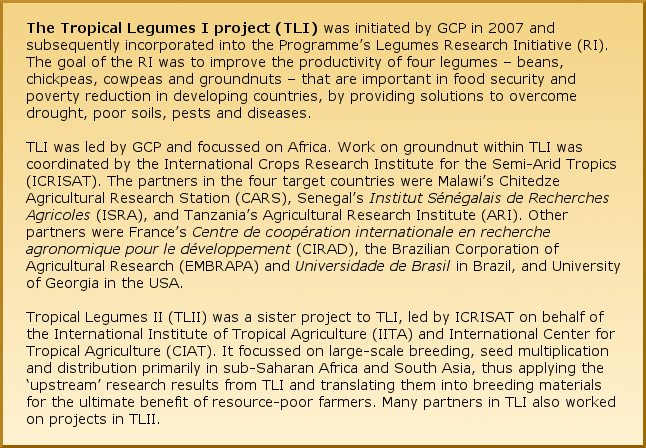 This newly found confidence and profile sees the NRCRI cassava team currently engaging with the Bill & Melinda Gates Foundation and the CGIAR Research Program on Roots, Tubers and Bananas (RTB) on research that will expand on and follow through on what GCP started. 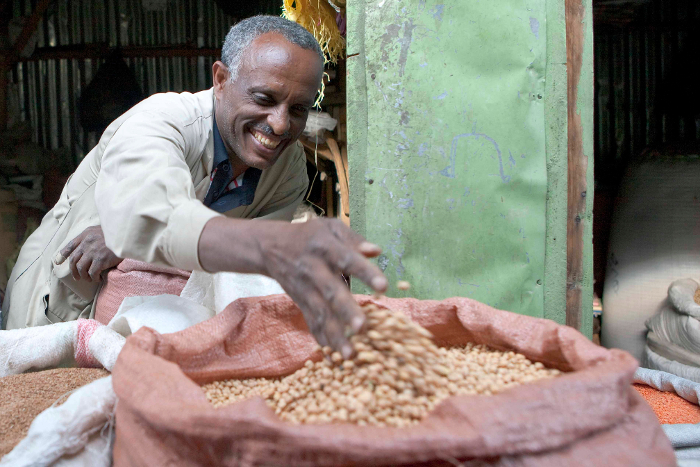 For Chiedozie, his dream of helping his country’s struggling farmers and people is coming true. 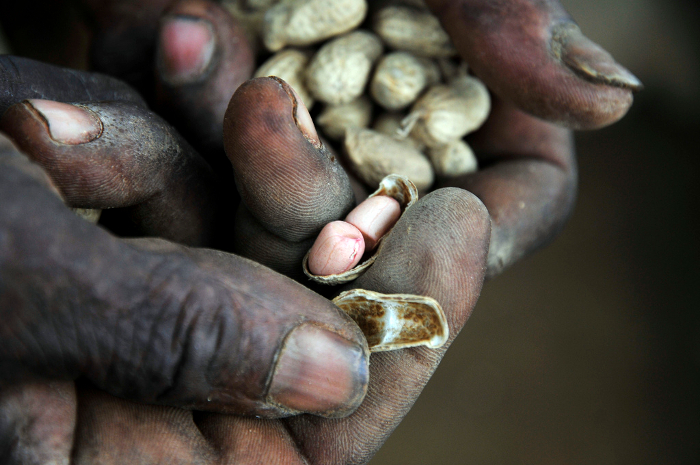 He has no regrets about dropping his dream of becoming a surgeon for one of helping his country as a plant breeder: “Coming from Umuahia, a small town in the southeast of the country, I grew up in an environment where you see people who are struggling, weak from disease, poor, and with no opportunities to send their children to school. 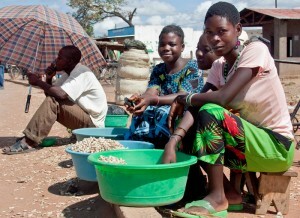 Elizabeth Parkes grew up in Ghana as the youngest child and only girl in a middle-class family of nine children. 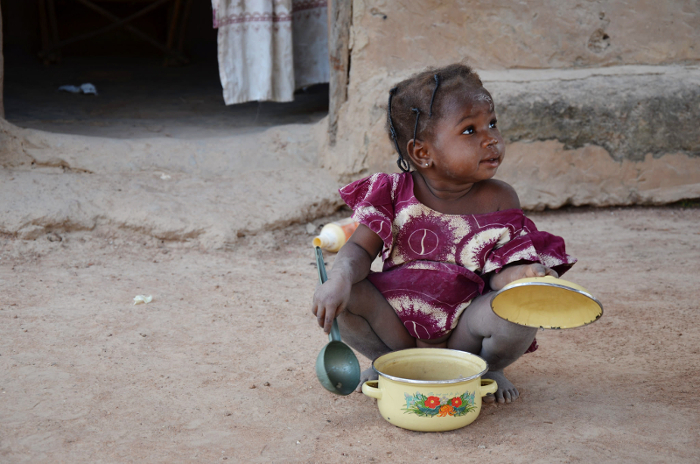 Through visiting poor communities with her family, she began from an early age to build her understanding of the lives of resource-poor families in this part of West Africa and their need for reliable and nutritious food. 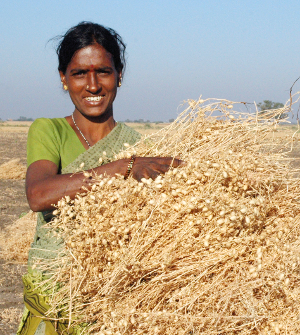 She also knows first-hand the important role women play on a farm and in a family. “Rural families are held together by women, so if you are able to change their lot, you can make a real mark,” says Elizabeth. 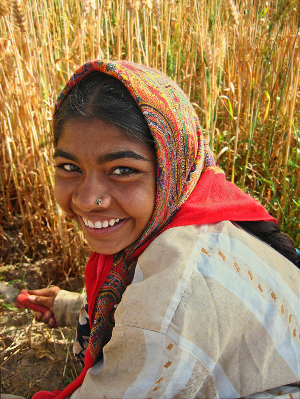 It was this sense of social conscience that drew her to a career in agricultural research: “My father, a Regional Education Officer, was not very amused; he thought agricultural research was a man’s job!” she recalls. 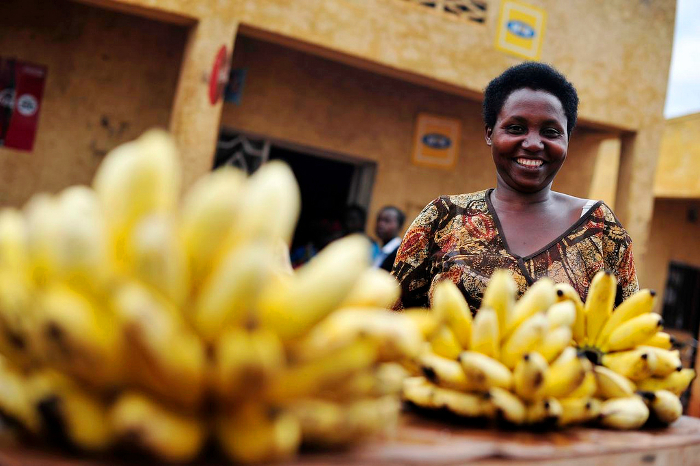 This sense of destiny led to Elizabeth gaining a Bachelor’s degree in Agriculture, a Diploma in Education and a Master’s in Crop Science. Meet Elizabeth in the complete podcast below (or see a playlist on PodOmatic) – and be inspired by her warmth and passion! 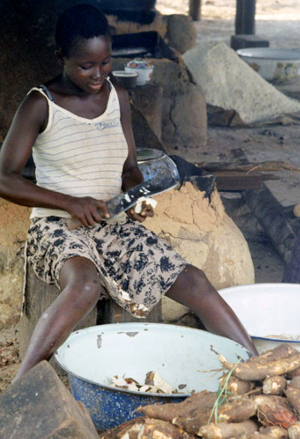 A worker in a Ghanaian cooperative producing garri, or gari, a kind of granular cassava flour used to prepare a range of foods. During a stint of national service between academic degrees, she was based in the tiny poor village of Aworowa in the Brong Ahafo Region. There was no electricity in her room, and the street lights came on once a week. 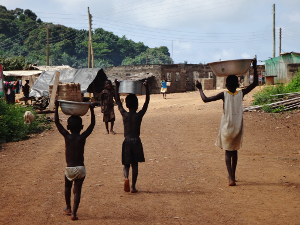 In a poor Ghanaian community everyone has to pitch in to the heavy daily round of chores. 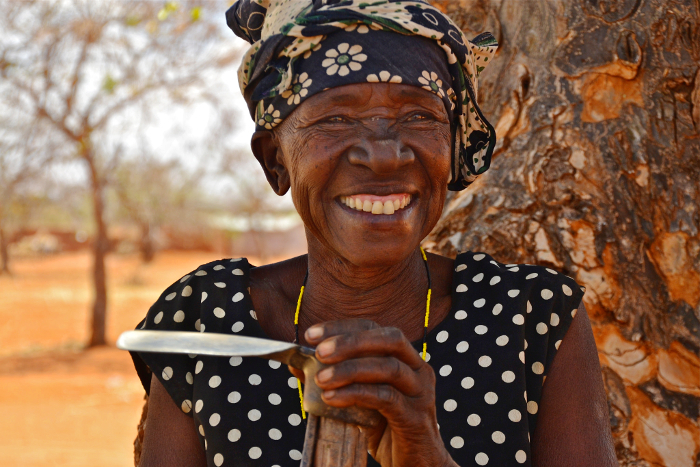 “We all fetched water from the stream to drink and cook,” Elizabeth recalls. 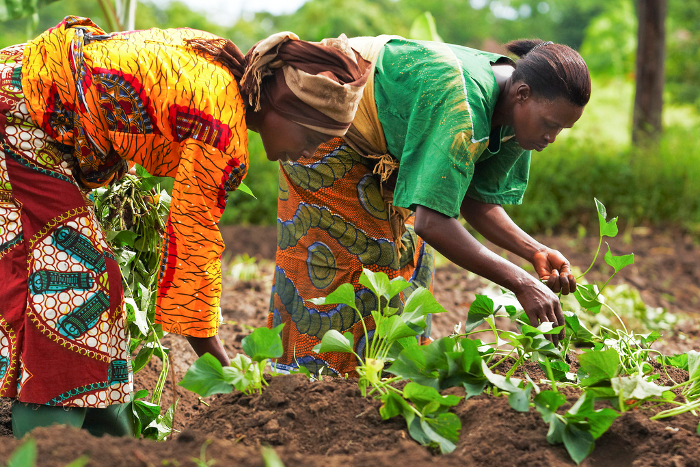 The plight of the villagers inspired Elizabeth to approach a scientist engaged in root and tuber projects at the Crops Research Institute (CRI) of Ghana’s Council for Scientific and Industrial Research (CSIR). 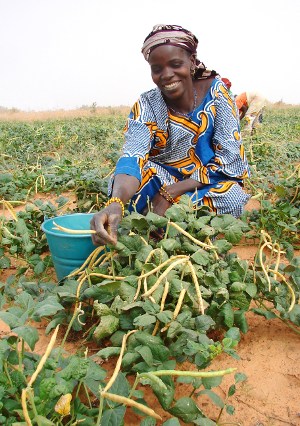 She offered to carry out some research on cassava, hoping this might help the local people. 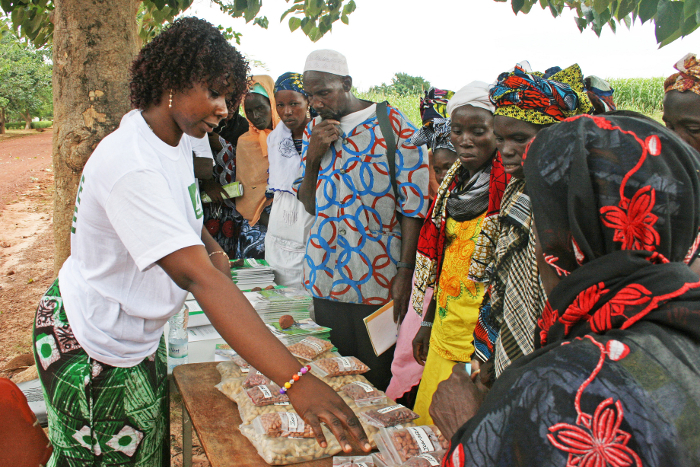 As a result, Elizabeth established CRI cassava trials in the region, and these trials continue today with Elizabeth still in touch with the villagers. When her year of national service finished, Elizabeth was appointed as Assistant Research Officer at CRI – their first woman to be assigned to a research project. Already, she was beginning to fulfil her destiny. 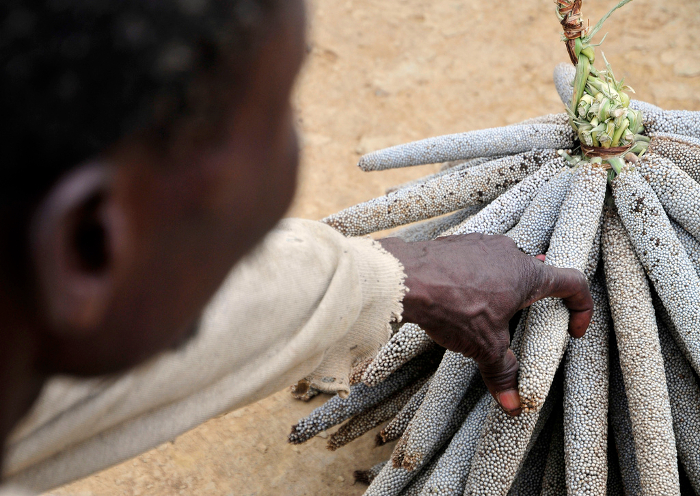 Unlike most crops, cassava is propagated, not by seed, but using cut sections of stem like these – just one of the many challenges this previously neglected crop offers breeders. 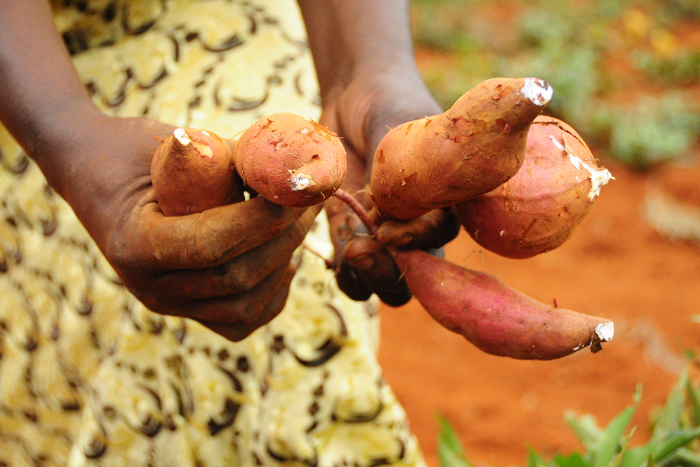 But cassava is not the easiest crop for a young researcher to cut their teeth on. 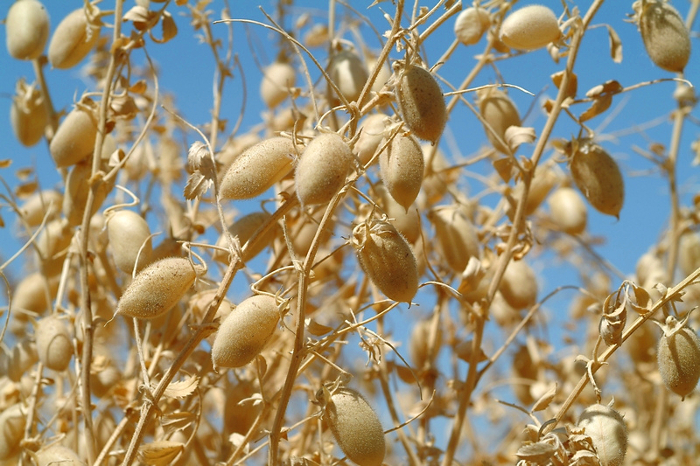 It has long been regarded as an ‘orphan’ crop – one that researchers and funders have forgotten in their drive to work with the higher profile crops of wheat, rice and maize. 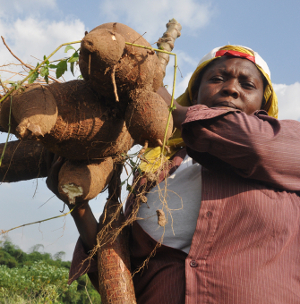 Cassava is a challenging crop for breeders to work with. 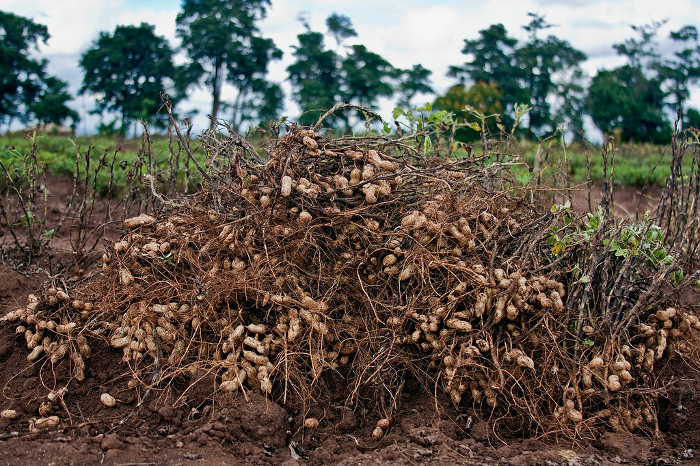 “In addition to factors such as pests and disease, cassava is a long-season and very labour-intensive crop. It can take a whole year before you can expect to reap any rewards, and if you don’t have a strong team who can step in at different points throughout the breeding process, you can often find unexpected results at the end of it, and then you have to start all over again,” Elizabeth says. 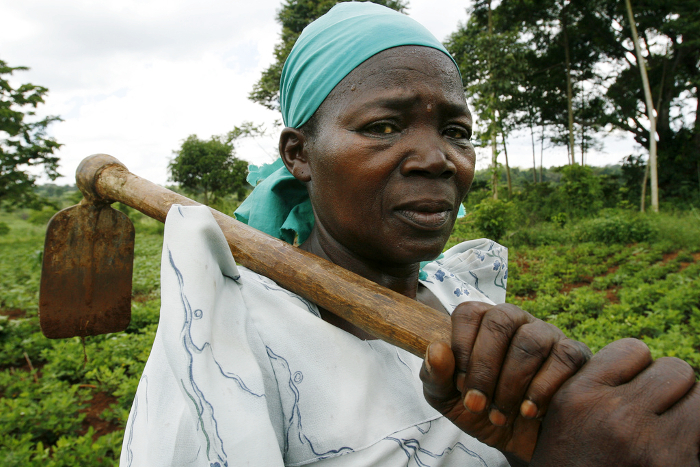 But while many other young researchers gave up on with cassava, Elizabeth stuck with it, knowing the importance of this crop to farmers, especially women. 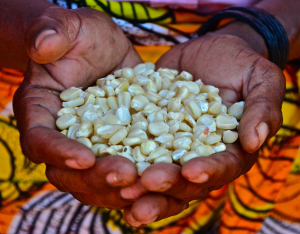 And this is where Elizabeth’s involvement with the CGIAR Generation Challenge Programme (GCP) really started to make a difference to her future. 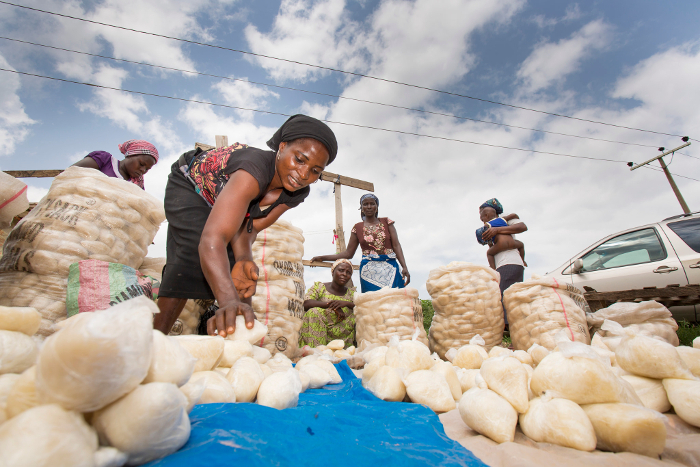 During GCP’s first research phase, Elizabeth’s path crossed with GCP scientist Martin Fregene, who encouraged Elizabeth to lead the Ghana partners involved in GCP’s cassava projects. She soon climbed the GCP research ranks, receiving multiple study grants, managing projects, and mixing and mingling with elite scientists. Along the way, Elizabeth also learnt new molecular breeding techniques. 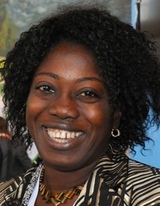 More recently, she was appointed Ghana’s lead researcher for GCP’s Phase II Cassava Research Initiative. 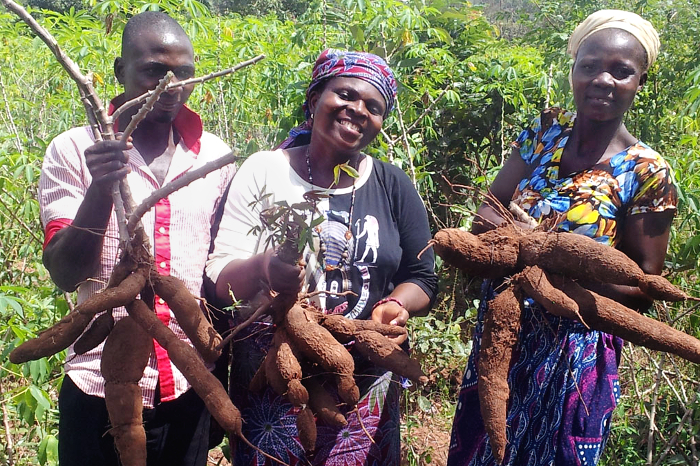 Elizabeth Parkes examines a healthy crop of monster roots from an improved cassava variety. Elizabeth believes the support GCP gave her to develop her skills and capacity is what has made a difference to her own and others’ destinies as research scientists: “GCP has made us visible and attractive to others; we are now setting the pace and doing science in a more refined and effective manner. I see GCP as the pace setters. “GCP gave you the keys to solving your own problems and put structures in place so that knowledge learnt abroad could be transferred and applied at home. Elizabeth has attended three GCP Annual (later General) Research Meetings and won awards for her posters. “This greatly boosted my confidence,” she says. 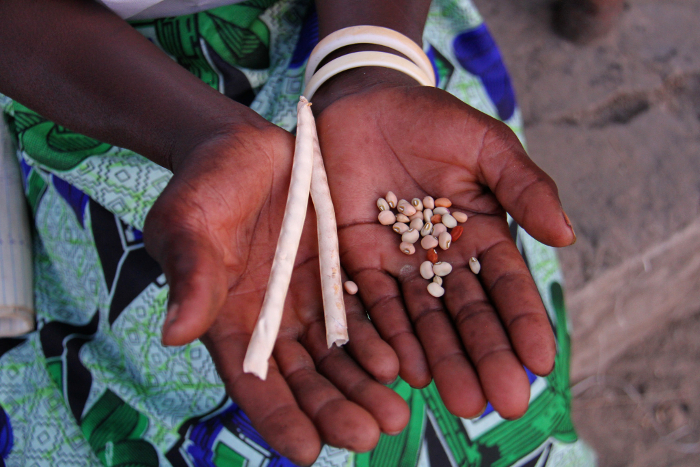 She is an active member of the Cassava Community of Practice – founded by GCP and now hosted by the Integrated Breeding Platform (IBP) – which facilitates and supports the integration of marker-assisted selection into cassava breeding. 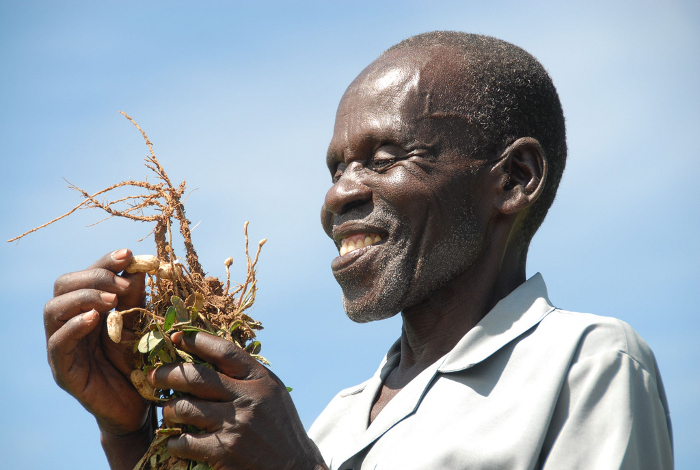 All this has accelerated Elizabeth’s quest to produce and disseminate farmer-preferred cassava varieties that are resistant to pests and diseases. 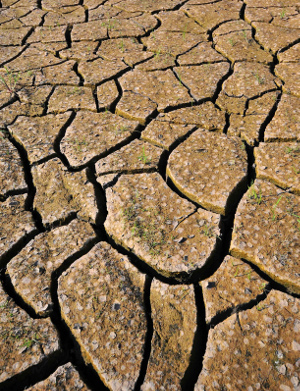 “With the Community of Practice you can call on other scientists; you share talk, you share ideas, you share joy. We share everything together,” Elizabeth enthuses. 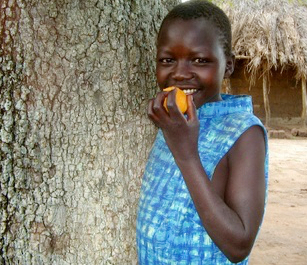 ‘Joy’ is a word that is often on Elizabeth’s lips when she describes the help that GCP has given her and others. 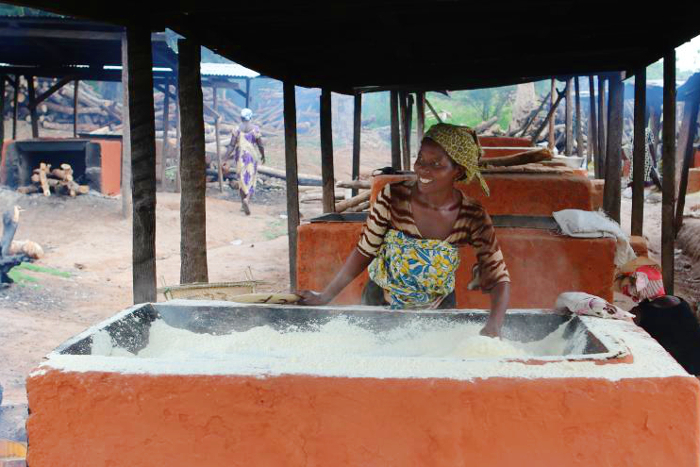 A farmer in Benin transforms cassava into garri, or gari, used as the basis of many different dishes. 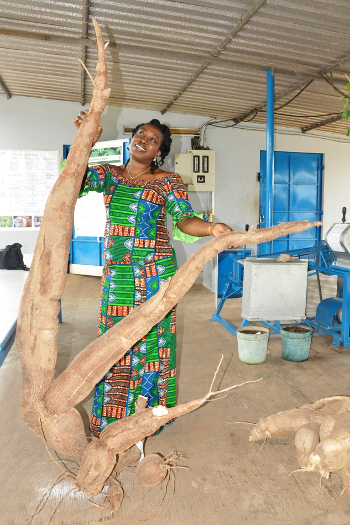 In less than a decade, Elizabeth has become a valued researcher at CRI (currently on secondment at the International Institute of Tropical Agriculture, IITA) as well as Ghana’s leading GCP-supported scientist working on cassava. 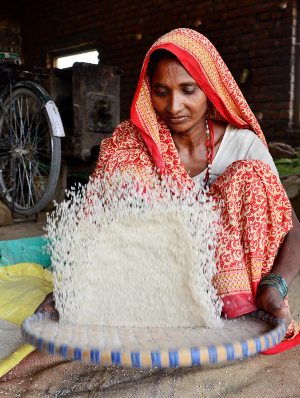 But in fulfilling her own destiny, she’s also passionate about helping others to achieve their potential. 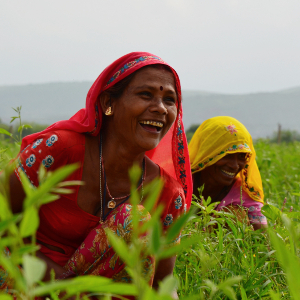 “Building human capacity is my greatest joy,” she says. 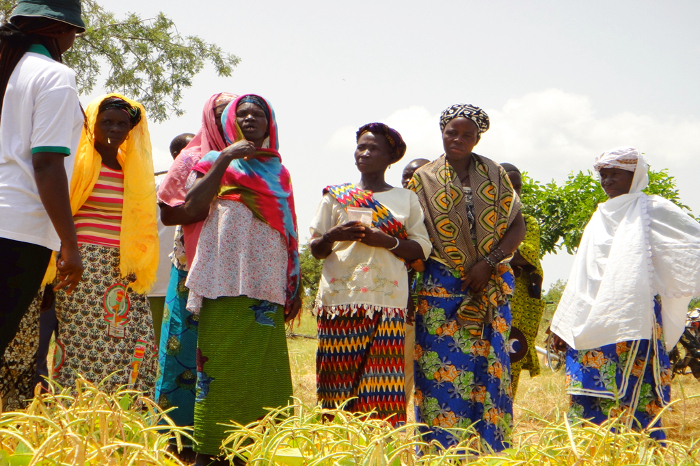 Farmers, breeders and a Ghanaian private-sector company are just a few of the fortunate beneficiaries of her expertise over recent years. 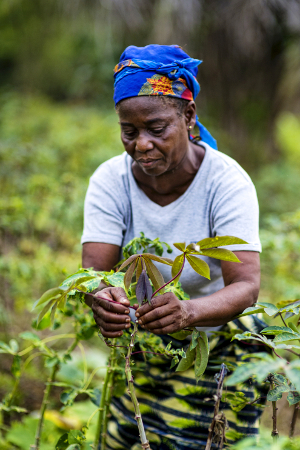 Angelique Ipanga tends her cassava plants in the Democratic Republic of Congo. 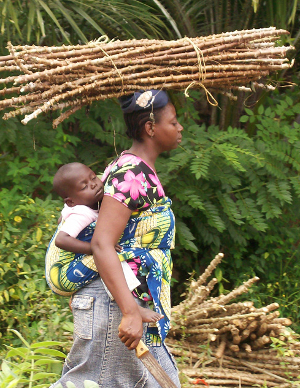 Cassava is often seen as a “women’s crop,” and the work of cultivating and preparing it falls largely on women’s shoulders. 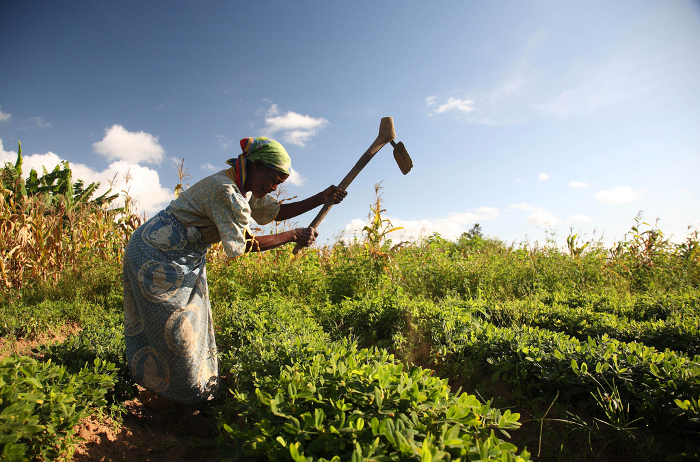 Bea hadn’t planted cassava before, so she pestered Elizabeth to find out more about how to do it properly. 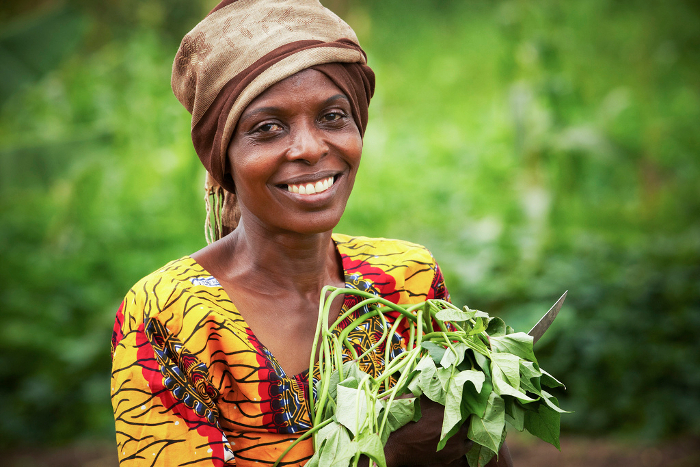 With Elizabeth’s guidance, Bea’s cassava-growing skills flourished, and she became so successful that she was recognised as the best farmer in her community. 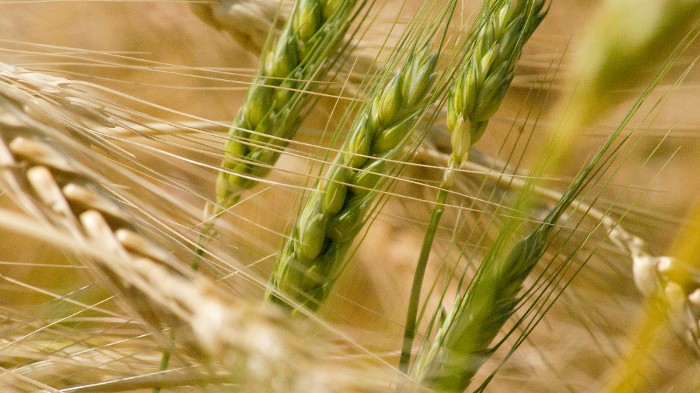 And so Elizabeth is now herself firmly established in world-class agricultural research, and further interesting stories are sure to follow. 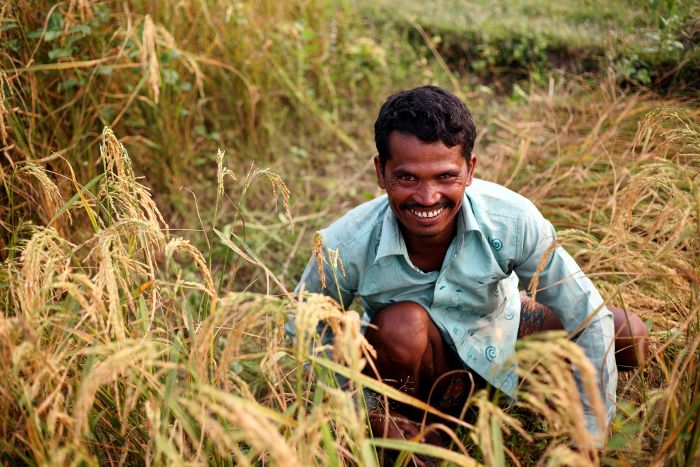 “Before GCP we really struggled, but now everybody wants to have training in Ghana. Everybody wants to have something to do with us, and I will always say thank you to GCP for that, for making us attractive as researchers,” Elizabeth says. Young Nigerian scientists often leave Africa and look for jobs with international research agencies overseas. 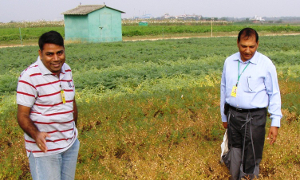 But with the CGIAR Generation Challenge Programme (GCP)-funded Cassava Research Initiative (RI), two young nationals have been leading the international collaboration and injecting confidence into Africa’s research capacity. Leadership is a quality admired and consistently sought after, particularly when overcoming a challenge. Some leaders direct from afar; others rise through the ranks and work with their peers on the ground – winning respect from the people they lead as they get their hands dirty. 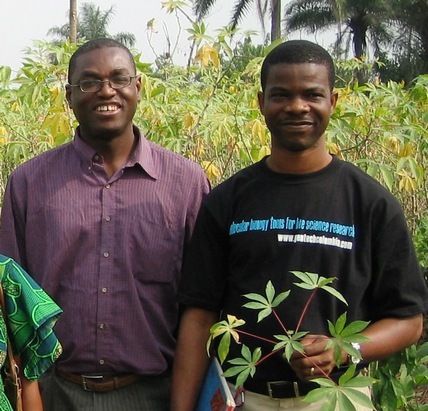 Dream team: Emmanuel Okogbenin (left) and Chiedozie Egesi (right), both of Nigeria’s National Root Crops Research Institute. 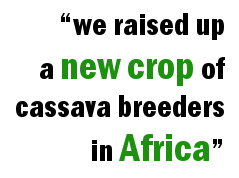 This powerful sentiment is one reason why GCP sought the collaboration of NRCRI in overcoming the challenge of sustaining Africa’s, and indeed the world’s, cassava production. The two researchers to whom Julius refers are Emmanuel and his colleague Chiedozie Egesi, also a plant breeder and geneticist at NRCRI. 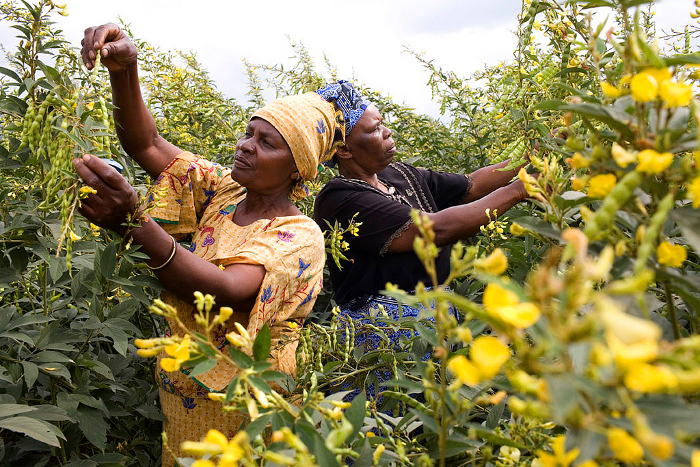 Their combined 36 years’ of cassava research experience is matched by their passion to get the best out of Nigeria’s main staple crop. 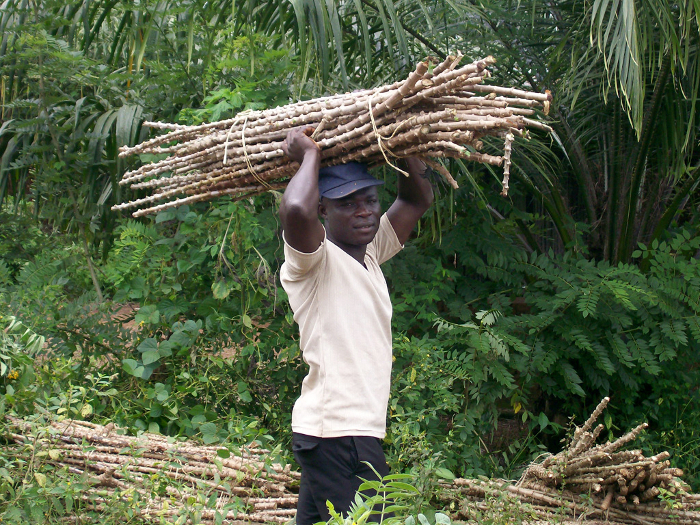 Nigerian farmers display their cassava harvest. 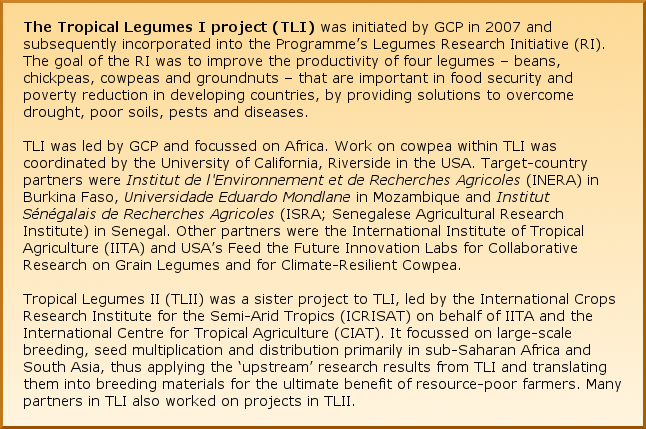 Between 2010 and 2014, both Emmanuel and Chiedozie led three different projects within GCP’s Cassava RI, working with other colleagues in national breeding programmes in Ghana, Tanzania and Uganda, as well as the International Institute of Tropical Agriculture (IITA), the International Center for Tropical Agriculture (CIAT), the Brazilian Corporation of Agricultural Research (EMBRAPA) and Cornell University in the USA. 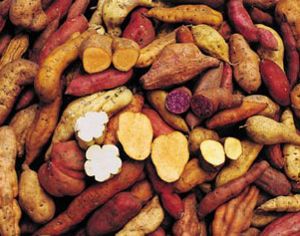 The aim of the initiative was to use molecular-breeding techniques to accelerate the development of high-starch cassava varieties with resistance to diseases and tolerance to drought – and so ensure both food supplies and income for farmers. 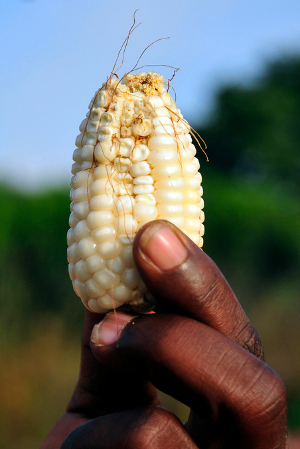 Emmanuel explains that before GCP, “most African national programmes didn’t really have established crop-breeding programmes, and didn’t have the resources” to do the scale of research GCP assisted with. 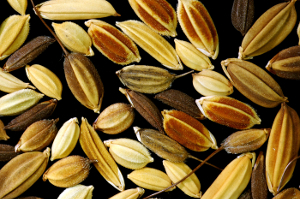 Nor did they have the capacity to use molecular-breeding techniques, which can potentially halve the time it takes to develop new varieties. 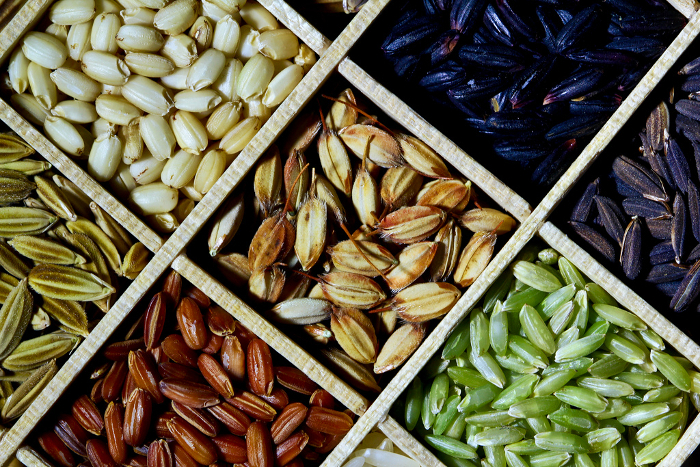 With help from GCP and CIAT, NRCRI was able to equip a new molecular-breeding laboratory, and staff were trained to incorporate molecular-breeding techniques into their breeding programme. “GCP was there not only to provide technology, but also to guide us in how to operate that technology,” explains Chiedozie. 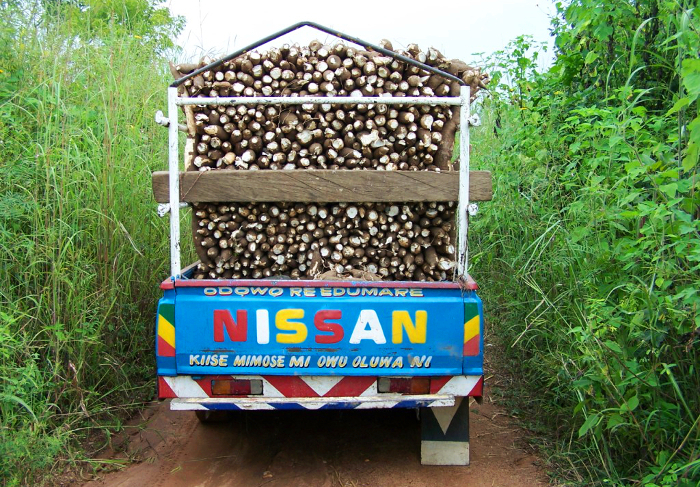 Transporting a bountiful cassava harvest from farm to market in Nigeria. 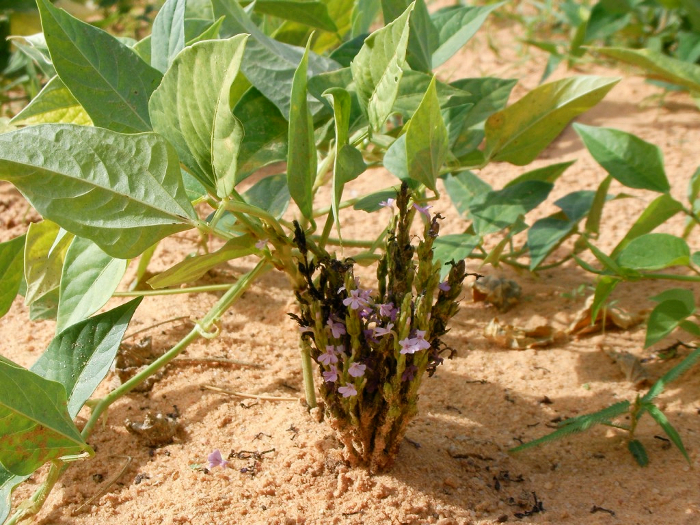 With training and infrastructure in place, NRCRI led an international collaboration that in 2010 released Africa’s first cassava variety developed using molecular-breeding techniques. 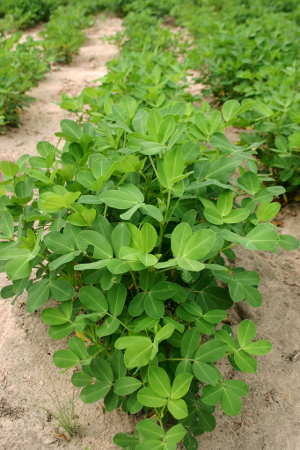 Known as UMUCASS33 (or CR 41-10), it was resistant to cassava mosaic disease (CMD) – a devastating plant disease that can wipe out farmers’ entire cassava crops – and also highly nutritious. This was swiftly followed by a second similar variety, CR 36-5, and supplied to farmers. 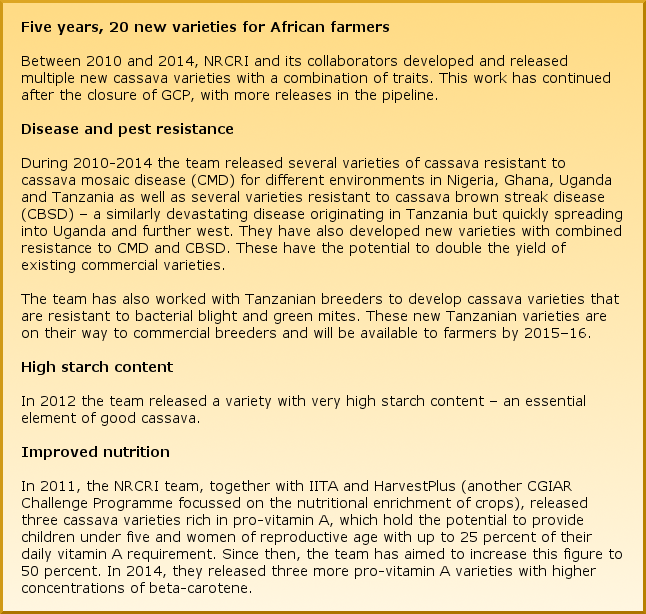 Between this landmark release and GCP’s close in 2014, the cassava team had already released nearly 20 higher yielding, more nutritious varieties resistant to diseases and pests, and had begun working on developing drought-tolerant varieties. 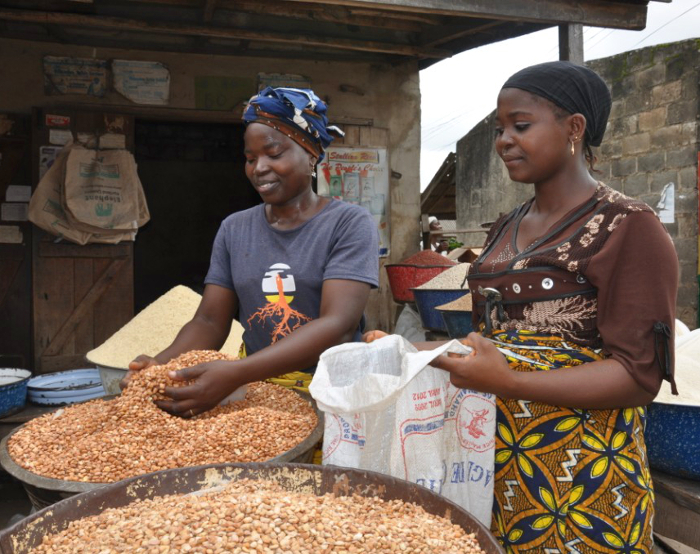 These new and improved varieties – all generated as a direct or indirect result of his engagement in GCP projects – are, Chiedozie says, worth their weight in gold: “Through these materials, people’s livelihoods can be improved. The food people grow should be nutritious, resistant and high-yielding enough to allow them to sell some of it and make money for other things in life, such as building a house, getting a motorbike or sending their kids to school.” This social aspect is particularly pertinent in Nigeria, where these cassava varieties will have the greatest impact. 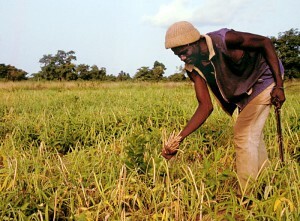 Nigerian farmer with his bountiful cassava harvest. 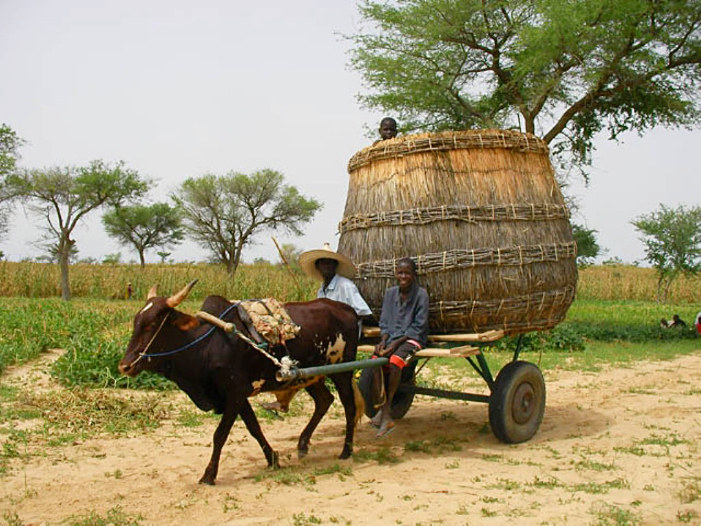 Nigeria is often referred to as the ‘Giant of Africa’. 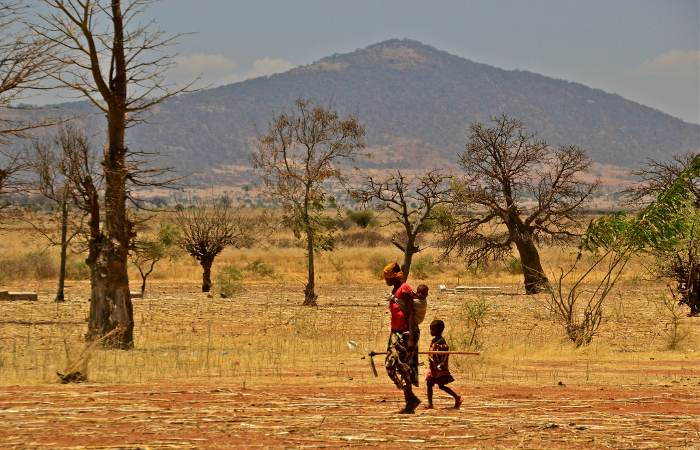 It is the most populous African country, with over 174 million inhabitants. 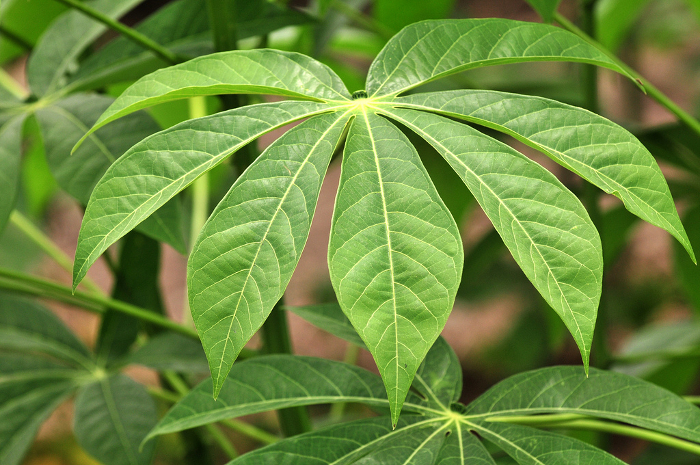 The population’s main staple food is cassava, making Nigeria the world’s largest producer and consumer of the crop. 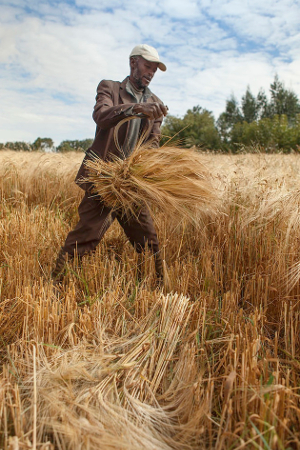 At the same time, the country imports almost USD 4 billion of wheat every year – a figure that is expected to quadruple by 2030 if wheat consumption continues to grow at the same rate it is today. 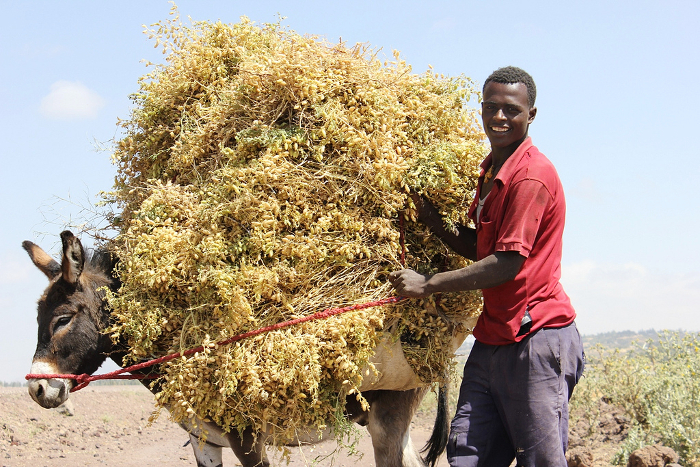 The government is wary of this ‘overreliance’ on imported grain and is working towards making the country less reliant on wheat by imposing a wheat tariff. 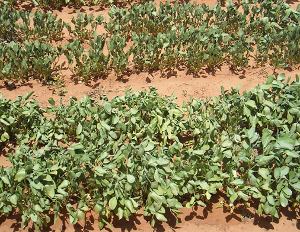 It also hopes to boost cassava production and commercialisation by promoting 20 percent substitution of cassava flour for wheat in breadmaking. 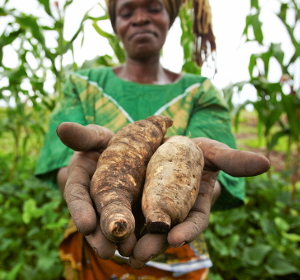 Cassava offers a huge opportunity to transform the agricultural economy, stimulate rural development and further improve Nigeria’s gross domestic product. In 2014, Nigeria’s economy surpassed that of South Africa’s to become the largest on the continent. 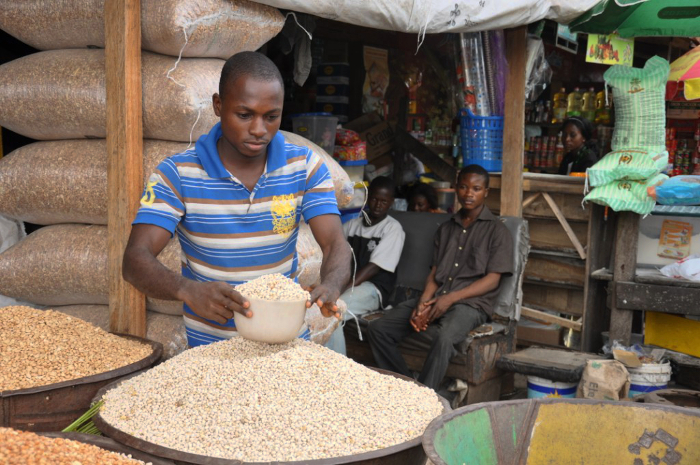 By 2050, Nigeria is expected to rise further and become one of the world’s top 20 economies. 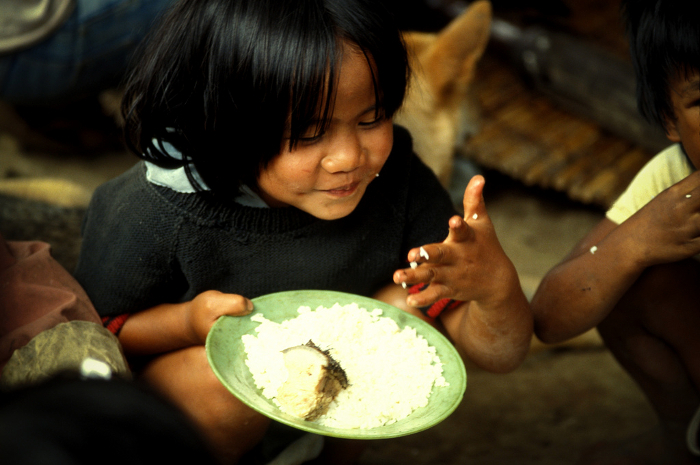 Unfortunately, however, like many growing economies worldwide, Nigeria is still working to address severe inequality, including in the distribution of wealth and in feeding the country’s expanding population. 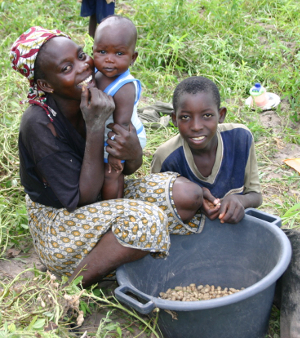 A woman with her children at work in a cassava processing centre in Nigeria. For Chiedozie, the seemingly bleak picture only served to ignite a fierce determination and motivation to act: “Despite the social injustice around me, I always thought there was opportunity to improve people’s lives.” And thus galvanised by the plight of Nigerian farmers, Chiedozie promptly shelved his plans for a career in medical surgery and pursued biological sciences and a PhD in crop genetics, a course he interspersed with training stints in the USA at Cornell University and the University of Washington, before returning to his homeland to accept a job as head of the cassava breeding team, and – following a promotion in 2010 – to become Assistant Director of the Biotechnology Department at NRCRI. 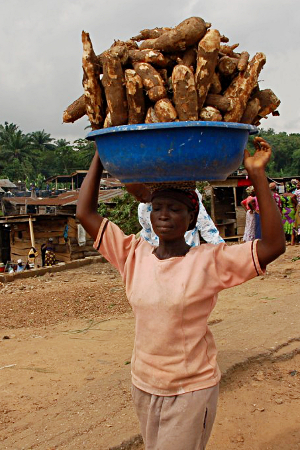 Carrying cassava at a processing centre in Nigeria. Emmanuel, who followed a similar educational route to Chiedozie, says both he and his colleague are exceptions to the norm in Africa, where African researchers tend to look for opportunities at international or private institutes rather than in national breeding programmes. 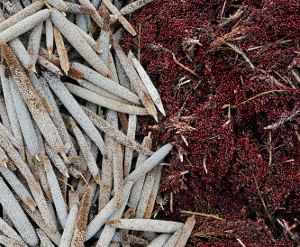 Before GCP came along, cassava was something of an orphan crop in agricultural research. 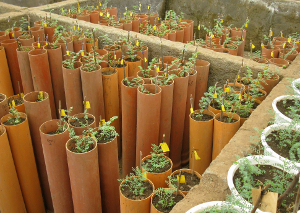 Among the challenges to efficient breeding of cassava are that it is slow to grow and is propagated, not by seed, but using cut sections of stem like those shown. 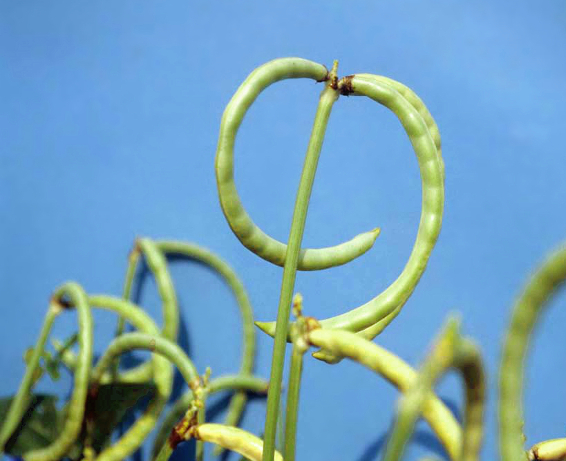 But with investment and capacity building from GCP, particularly in molecular breeding tools, African cassava scientists have gained a new confidence and prestige. 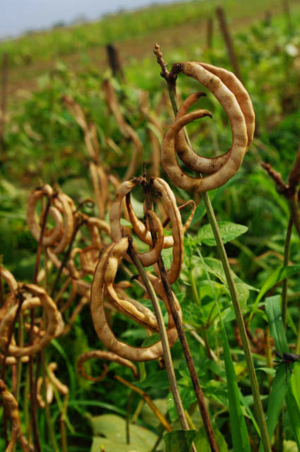 One organisation that has been impressed by the work done at NRCRI is the CGIAR Research Program on Roots, Tubers and Bananas (RTB). RTB Director Graham Thiele has been following the work done at NRCRI since 2010 with great interest. 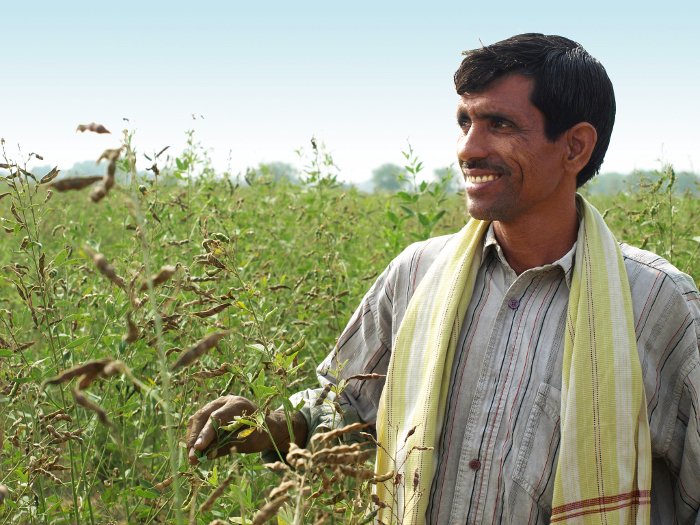 “We have been really impressed to see a national programme like NRCRI playing a leading role in these successful GCP projects, and grow as a result of this,” he says. 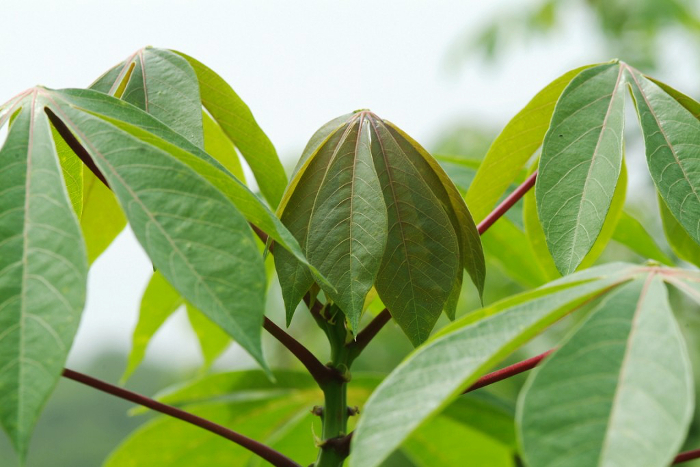 One area of research that has particularly impressed Graham is Chiedozie and Emmanuel’s pre-emptive breeding for cassava brown streak disease (CBSD) resistance. 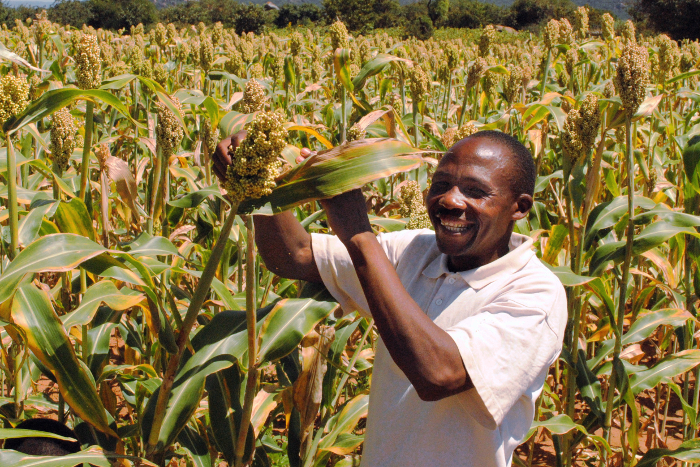 “CBSD isn’t currently an issue in Nigeria but it has the potential to wipe out all crops, as it has in Uganda and Tanzania, if it continues to spread west from these countries,” he explains. As GCP approached its sunset in December 2014, Chiedozie and Emmanuel were reaching out to RTB to seek funding to continue this and other projects they are currently working on. 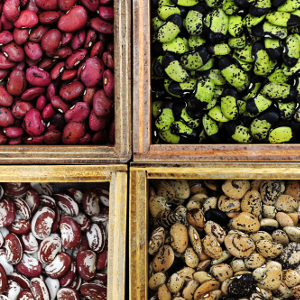 “They’ve already created some great varieties but have plenty more in the pipeline, so we want to help them finish this work and, most importantly, keep the momentum going,” says Graham. 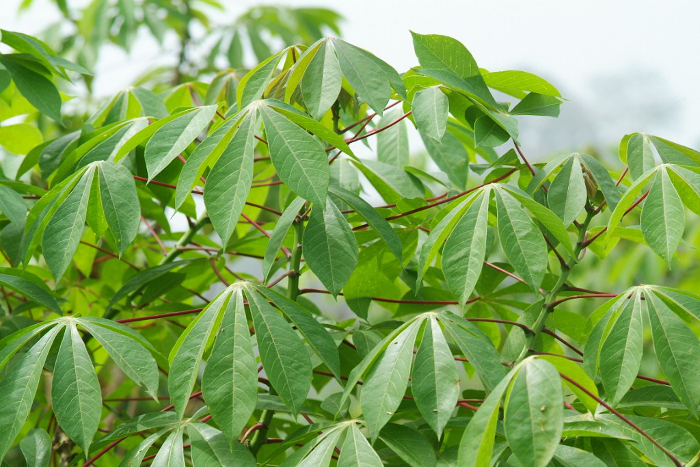 Healthy improved cassava varieties growing in the field.